2. What is an entity supertype? 4. What are the disadvantages of using subtypes of entities in database developing? 5. What are the advantages of using entity subtypes when designing databases? 6. What type of relationship is established between a supertype and a subtype? Entity subtypes are entered into the ER model in order to reduce the total number of attributes of each entity. Each entity has a set of unique attributes. However, the attributes of different entities can be repeated. Therefore, it is necessary to develop the ER-model so that the number of repeated attributes in different entities was minimal or reduced to zero. Repeating attributes carries redundancy in the database. The size of the database becomes unreasonably large, so this problem needs to be fixed. Entity subtypes are used to solve this problem. The idea of using an entity subtype is that a supertype is allocated for the entire diverse set of entities, which contains information common to all types of entities. Details (subtleties) of each type of entity are taken out separately in several specialized subtypes. the entity type “Support personnel” has a staff rate, a weekend or working day ratio (if the employee worked on weekends), etc. entity subtypes “Administration”, “Teacher”, “Support staff” are introduced. Each of the entity subtypes has its own unique attributes. An entity supertype is an entity type in which only common attributes are implemented (described) for entity subtypes that use this supertype. Entity subtypes may or may not intersect. If a subtype of one entity may be suitable for a subtype of another entity, then this means that these subtypes of entities intersect each other. Otherwise subtypes of entities do not intersect. Example. In an educational institution, an employee who holds an administrative position (subtype Administration) may be a teacher. That is, the entity subtype Administration intersects with the entity subtype Teacher. However, an employee from the entity subtype “Support staff” cannot be a teacher. Therefore, the entity subtype “Support staff” does not intersect with the Teacher subtype. In view of the above, the image of the supertype and subtypes in the diagram has the form, as shown in Figure 2. 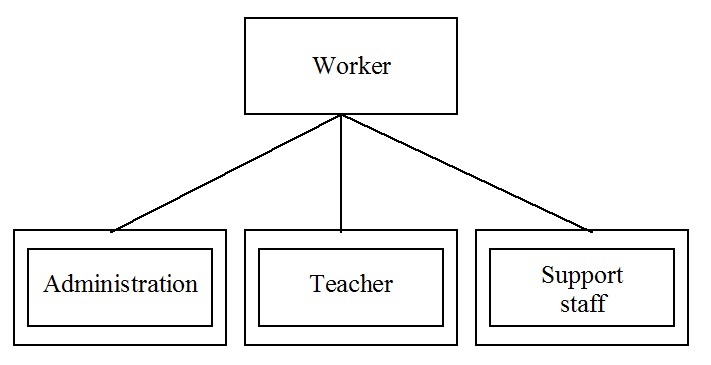 In Figure 2, between the subtypes Administration and Teacher is a text Gs. This means that subtypes can intersect. 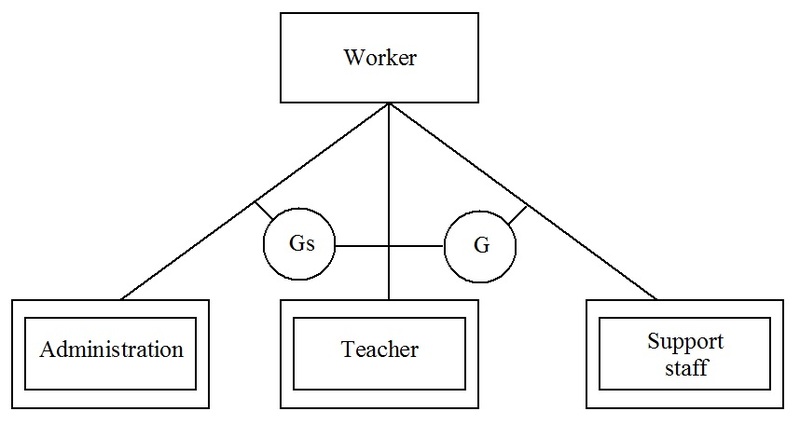 Between the Teacher and the Support Personnel subtypes is a symbol ‘G’. This means that entity subtypes do not intersect. Each supertype and subtype of entities is implemented by a corresponding table. Table fields are attributes of this type of entity. difficulty in providing secure of user access to table columns. flexibility in modifying the database structure. You do not need to modify the supertype table if you add / change the structure of the subtype table. This, in turn, leads to the fact that there is no need to redo the entire database management program. Between the supertype and subtype set relation “one to one” or 1:1.